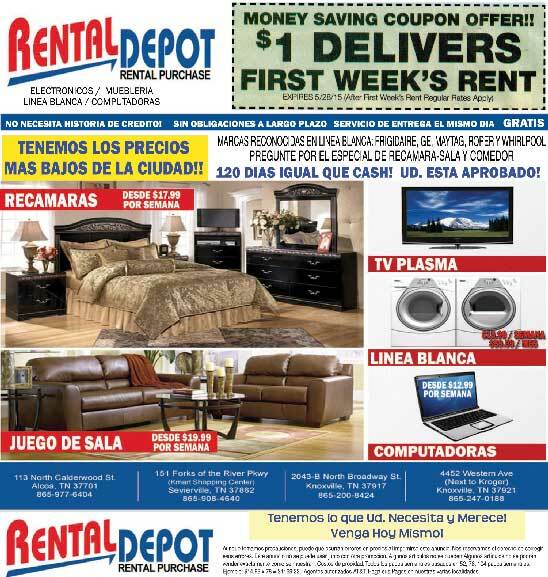 La compañía de renta y ventas de artículos para el hogar RENTAL DEPOT pone a la disposición de la gran clientela hispana del Este de Tennessee cuatro grandes tiendas con los artículos del hogar que la familia hispana disfruta a diario. Si desea una copia de la agenda por favor póngase en contacto con el MPC . Si necesita ayuda o acomodo para una discapacidad, por favor póngase en contacto con el MPC y estaremos encantados de trabajar con usted para satisfacer cualquier solicitud razonable. Ph . 865-215-2500 ·contacttpo@knoxtrans.org . Wednesday, April 1 ’til Saturday, April 4 get one Free Large Pepperoni Pizza with the purchase of any pizza at regular price. Papa Murphy’s is the largest take ‘n’ bake pizza chain in the United States, selling scratch-made pizzas that customers take home and bake in their own oven for a convenient home-baked meal. The Company recently completed acquisitions of existing Papa Murphy’s franchise stores in Knoxville, TN as a springboard for further expansion throughout the Southeast. Papa Murphy’s makes fresh dough in-store daily and tops its pizzas with fresh, never frozen ingredients including vegetables chopped daily, 100 percent whole-milk mozzarella – grated in-store each day, high quality meat with no added fillers and specialty, premium ingredients like spicy fennel sausage, Angus steak, roasted garlic and artichoke hearts. The company core purpose is to bring families together through food people love with a goal of creating fun, convenient and fulfilling family dinners.